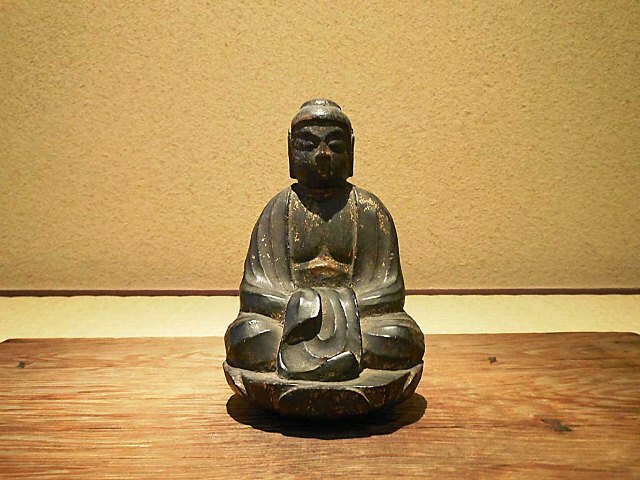 This small Buddha sculpture has proven to be a favorite amongst recent visitors to the gallery. 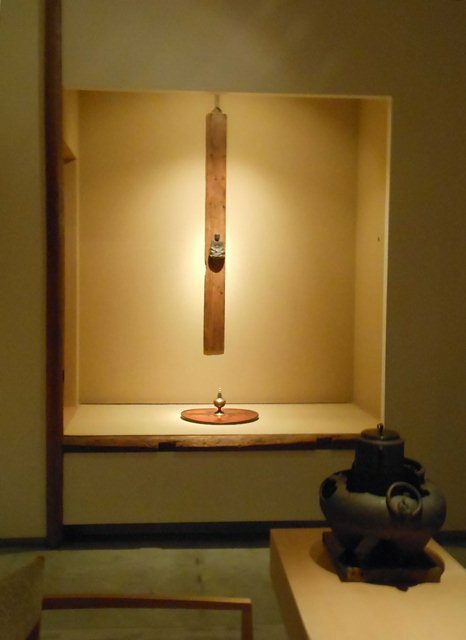 We often display it hanging on the wall, but this time we have placed it directly on the tatami in the display alcove, with only a thin board to act as its base. This small buddha once adorned the mandorla of the central Vairocana Buddha of the temple Tōshōdaiji in Nara, and is generally known as one of the "Thousand Shakas," or a "Transformation Buddha." Vairocana is the great cosmic Buddha said to simultaneously represent both emptiness and all things in the universe. The multitude of small buddhas that fill the mandorla behind him represent the infinite number of buddhas found throughout the universe, with the idea that in every conceivable world, a Shaka Buddha will appear. At present there are 864 of these small buddhas surrounding the central deity of the Tōshōdaiji, just over 300 of which have been there from the time the temple was built in the Nara period (710 - 784). As the name "Thousand Shakas" suggests, there must surely have been 1,000 images originally adorning the mandorla, which would have been an incredible sight to behold. We hope that you will stop by the gallery soon and see this rare piece of history for yourself. 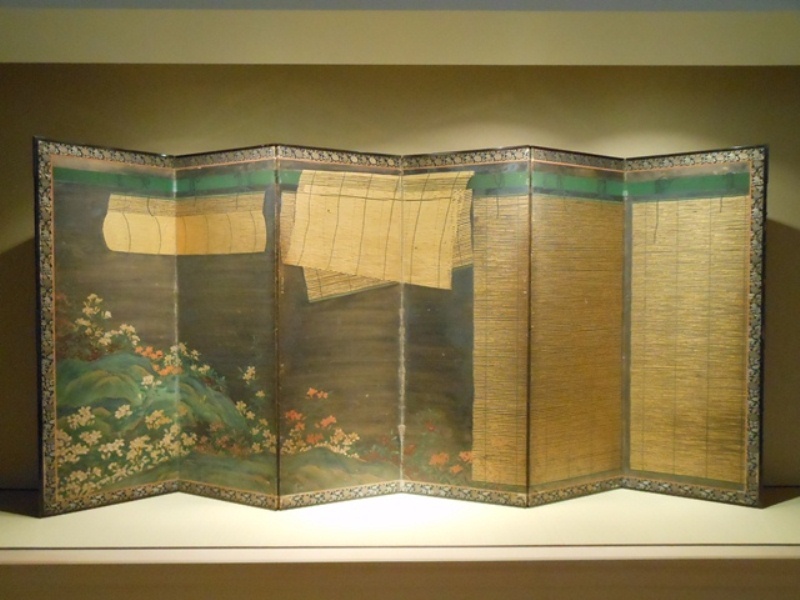 As part of the new display at the Shirokane gallery is this screen depicting rolling bamboo blinds, called sudare, partially obscuring the outdoor scene beyond. In this work, it feels as if you are able catch a glimpse of a separate world that lies on the other side of the blinds. We hope that you will take the time to stop by and see them in the near future. 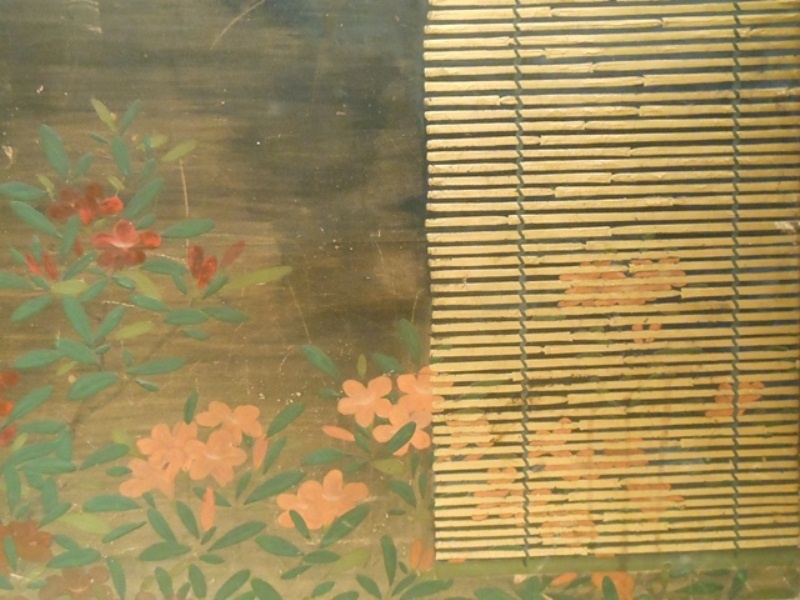 Beginning with the sudare screen, the exhibition features works of art with flower and bird themes to welcome in the early summer. On Saturday May 26, the galleries at the Shirokane Art Complex will be having a joint reception (1F Kodama Gallery, 2F ARATANIURANO, 3F Yamamoto Gendai). London Gallery will be open to visitors from 6:00 to 8:00pm, and we hope to see you there. Please be aware that there will be a rotation of displays midway through the exhibition. We would like to announce that London Gallery's Shirokane location will be closed for three days from Wednesday May 16th to Friday May 18th. We apologize for the inconvenience. 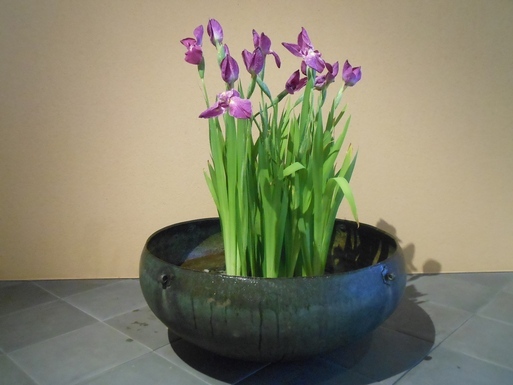 The gallery　in Roppongi will be open according to its regular schedule, and we invite you to visit there any time.